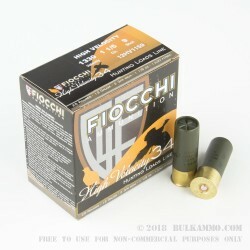 This high velocity birdshot ammunition from Fiocchi is a great choice for low-cost hunting or target shooting. Packed in boxes of 25, these shells fire a 1 1/5 ounce column of #9 shot at 1,330 feet per second out of the muzzle, delivering excellent patterns at medium range. 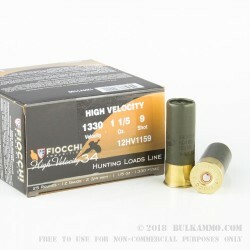 Fiocchi loads this ammunition at its American manufacturing plant in Ozark, Missouri. It's inexpensive yet reliable and makes a great sporting load for your 12 gauge shotgun! 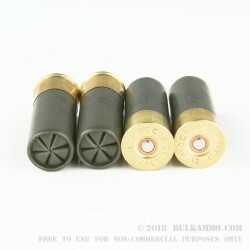 If you're looking to use your shotgun for both sport and self-defense, check out BulkAmmo's selection of buckshot loads. 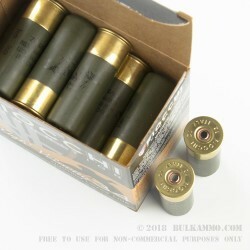 We carry every kind of shotshell you need in stock and in quantity to help you save on shipping costs.